Undefeated Okolie faces Camacho, with the British and Commonwealth titles at stake on the undercard of Charlie Edwards' WBC title defence against Angel Moreno at the Copper Box Arena on Saturday, live on Sky Sports. 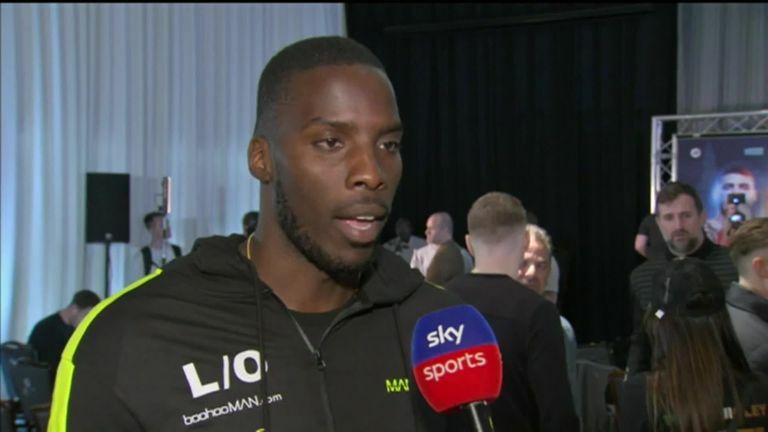 "On paper it's going to be a good test," Okolie told Sky Sports. Usyk is moving up, so I have to set my sights on that. I don’t want to be British champion for five years of my career or whatever. "He's taken a lot of good British fighters the distance, he's on a good winning streak, Commonwealth champion. It should be a competitive fight on paper, but I don't kind of feel that way, I'm looking forward to it." The 26-year-old is confident of handing the Barcelona-born southpaw his fourth stoppage defeat of his seven-year professional career. "I like to think that I should be stopping someone like Wadi Camacho if I am where I visualise myself," added Okolie. "So if I'm unable to do it, then I'll have to go home and take a look at myself and say 'am I who I think I am'. I don't want to have to do that, so I'm going to knock him out." Okolie is already looking beyond Camacho and has set his sights on claiming one of the world titles which Oleksandr Usyk is likely to vacate should the undisputed cruiserweight champion step up to the heavyweight division later this year. "Usyk is moving up, so I have to set my sights on that," he said. "I don't want to be British champion for five years of my career or whatever. World title's there, world title's mine."